The conditions at my home are usually terrible for astrophotography. Typically the limiting visual magnitude is 3 or 3.5. On this night the transparency was excellent, and I could see mag 4 stars even southward over the city of Boston (less than 5 miles away), where the constellation of Orion was. There was also a five day old moon in the constellation of Taurus, near Orion. The field of view of this lens is about 17° across, and this is the full frame. 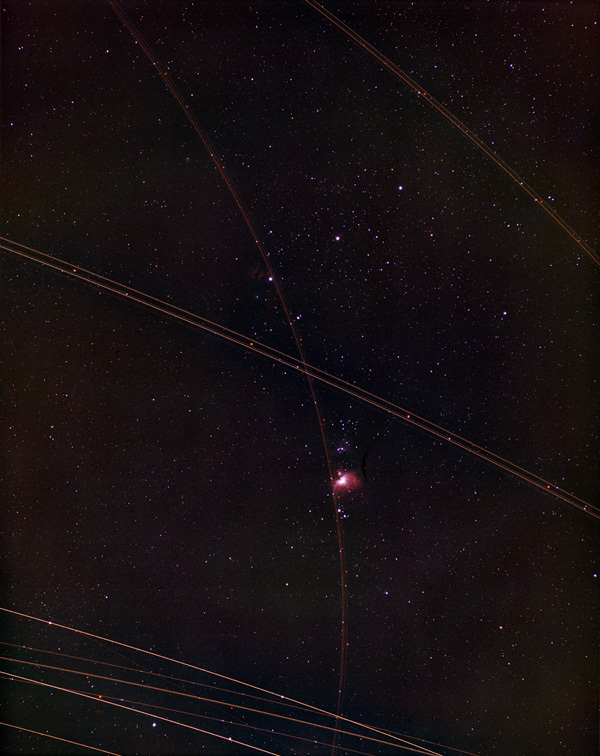 What's notable about this image of Southern Orion is how many jets flew through the field of view in a short period of time. This was supposed to be just a focus test, so I didn't worry too much about the trails.